She has become used to such insults, she said, although it really hurts. “How would you be feeling, if such insults were hurled to your daughter?” she asks. Barely a decade ago, you could hardly catch a glimpse of obese people like Kambogi in this impoverished slum, who, at 5 feet 7 inches tall and 129kg, is overweight. Malnutrition is still wreaking havoc in Tanzania where thousands of people are hungry. However, growing household economies in many places have triggered an obesity crisis. In Dar es Salaam, one of the fastest growing cities in Africa with a population growth rate of 8 percent, many residents are eating junk food. They also don’t exercise regularly, as a majority of residents have abandoned active village life and moved into the city, where they become inactive. But obesity rate in the east African country is rising fast, more than doubling in recent decades, and many city residents have seen their waistlines rapidly expanding. Fast-changing lifestyle coupled with improving household economies have propelled the rate of obesity which culminates in diabetes at an alarming rate in Tanzania, with urban areas leading the tally. Medical experts say the metabolic disease is a looming health hazard in the country. The burden of diabetes and cardiovascular diseases such as hypertension is high in Tanzania. The prevalence of diabetes in urban areas has increased from 5 percent in 2007 to 9 percent in 2012, while in 2012 a survey showed that the prevalence of hypertension 26 percent, according to the available government data. Despite its growing risk, people rarely take precaution, such as eating healthy foods and engaging in regular exercise. In Dar es Salaam, local experts say, the most affected group is middle-aged people, majority of whom have diabetes without knowing. Kambogi, who doesn’t understand the growing risk of contracting metabolic diseases, says she eats cheap junk food because fish and vegetables, which would make her slim, is beyond her budget. She is a single mother, working as a street hawker selling fried sardines, earning about US$60 a month to support her three children. Kambogi is not alone. While low-income families in the impoverished slum have just enough money to buy junk foods like chipsi mayai (fried potato and egg omelet), which are widely available cheaply, many of them often do not exercise. Some of the least expensive foods to buy in the Tandale slum where Kambogi lives are chipsi mayai, a plate of which fetches around 2500 shillings (approximately US$ 1). “I like chipsi mayai and soda,” Kambogi said with a guilty smile. Sub-Saharan Africa is in the midst of a rapidly expanding diabetes epidemic that could have devastating health and economic consequences for the region unless decisive actions are quickly taken to turn the tide, experts have warned. The 2017 report from the Lancet Diabetes & Endocrinology Commission – the first comprehensive examination of diabetes in sub-Saharan Africa, provides an analysis of the burden of diabetes and the challenges it poses for health systems across the region. According to the report, more than 90 percent of diabetes cases in sub-Saharan Africa are type 2 diabetes, suggesting that modifiable risk factors fuel the severity of the disease. Currently, only half of those with diabetes are diagnosed, and of those, only 1 in 10 are receiving treatment, the report noted. The report warned that if nothing is done to address the problem, overall cost of diabetes in the region could triple to more than $59 billion or 1.8% of the region’s GDP by 2030, thus resulting in loss of productivity due to illness. Godfrey Urio, a teacher in Dar es Salaam, was diagnosed with Type 2 diabetes at the age of 35, but he suspected he had the disease before then. Every morning, Urio administers insulin jab on his arm to help his body maintain a healthy level of blood sugar. But routine monitoring is hard; consequently, he often experiences abrupt falls in blood sugar levels. When that happens, Urio feels dizzy and must immediately grab a sweet drink, like orange juice. Too much juice, however, causes a sudden spike of his blood sugar. Such extremes are very damaging to his body. Five years ago, Urio, who lives in the bustling Mbezi surburb in Dar es Salaam, experienced difficulties in walking, a result of peripheral neuropathy – a common complication of diabetes that causes pain and numbness. This pain, made worse by foot ulcers, forced him to abandon his teaching job. The 45-year-old father of six understands the risks factors including drinking alcohol, but he says he cannot control them. About 425 million people around the world have Type 2 diabetes, including about 16 million in Africa, according to International Diabetes Federation (IDF). Dr. Zulfiqarali Abbas, a Dar es Salaam-based consultant physician and endocrinologist, told Health Policy Watch that many Tanzanians are troubled with Type 2 diabetes, which occurs when body’s cells fail to react with insulin circulating in the body after eating. The risk of getting diabetes occur when the person does not burn off excessive calories. The symptoms of diabetes include excessive thirst, increased frequency of urination, weight loss, weak vision and numbness or burning sensation in the limbs. According to IDF estimates, the number in Africa is likely to rise to 41 million by 2045. In Tanzania, there were 897,000 reported cases of diabetes in 2017. According to IDF, the prevalence of diabetes is 3.6 percent of the total adult population of 25 million. However, local experts say the number is likely to be more. Type 2 diabetes can wreak havoc on the entire body, affecting everything from hearing and vision to sexual function, mental health and sleep. It is the leading cause of blindness, and kidney failure, and it can triple the risk for heart attack and stroke. But with strict monitoring, experts say a patient can manage the disease and live a normal life. 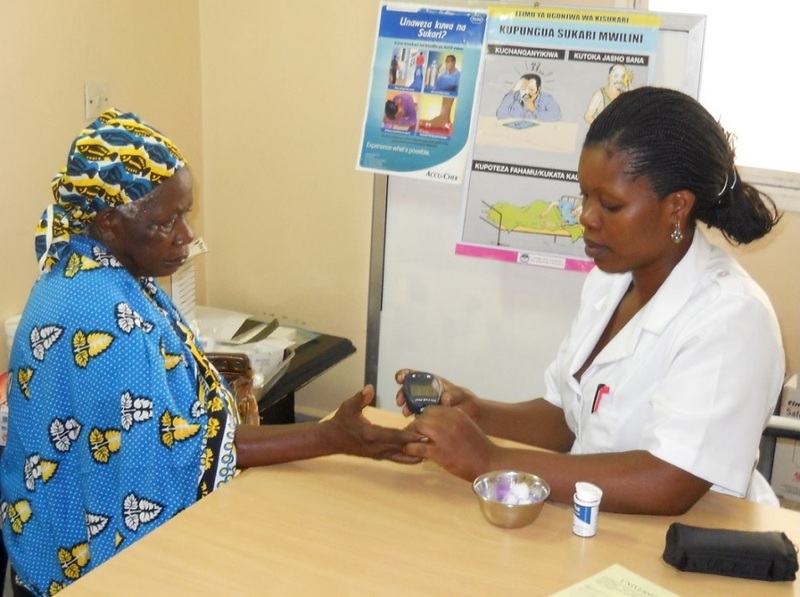 In an effort to curb the metabolic syndrome – a clustering of risk factors including obesity, insulin resistance and hypertension that culminate in the increased risk of Type 2 diabetes, the Tanzania Ministry of Health Community Development Gender, Elderly and Children, in conjunction with other stakeholders is trying to establish diabetes clinics across the country to raise awareness. Kaushik Ramaiya, consultant physician at Shree Hindu Mandal Hospital in Dar es Salaam and Board Member of World Diabetes Foundation urged the government and policymakers to put in place cost-effective prevention strategies and promote diabetes education as important elements in preventing the disease from further spreading. “If the society is fully educated and understand the risk factors, we can prevent many people from getting this disease” he told Health Policy Watch by phone. Ramadhan Mongi, executive director of Tanzania Diabetic Association (TDA), the rate of prevalence of diabetes has shot to more than 10 per cent among adult population in urban areas in the last 10 years. Hypertension and diabetes generally coexist because they share similar risk factors, including being overweight, following an unhealthy diet, and being inactive. Prevention of these diseases has been through reduction of lifestyle related risk factors by practicing healthy eating, physical exercises, stop smoking and reduction of alcohol consumption. Image Credits: Muhidin Issa Michuzi.